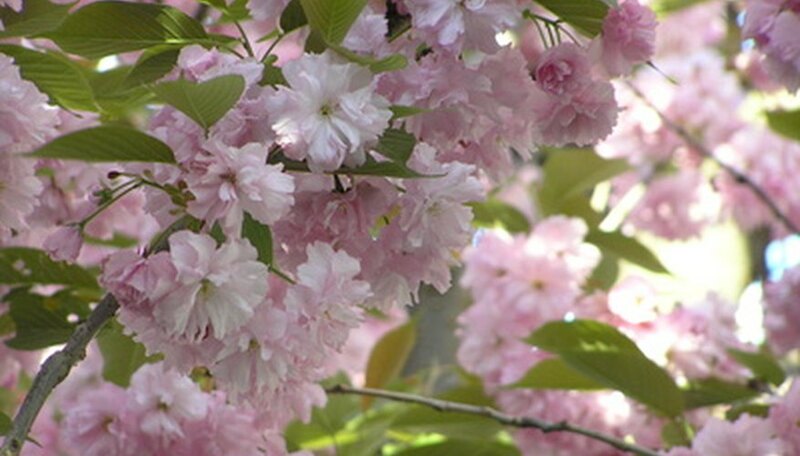 The Japanese flowering cherry is a popular spring-blooming ornamental tree. The tree is native to Japan and hardy to plant in USDA growing zones 5 through 8. Japanese flowering cherry trees can be propagated by rooting softwood stem cuttings taken from the tree in late spring through early summer. A softwood cutting is a stem section of current-year growth that is just beginning to harden yet is still soft and flexible and produces roots easily. Cut 6- to 8-inch softwood sections of the flowering cherry tree branches with a sharp knife. Place the tender cuttings in a plastic bag with a moist paper towel to prevent them from drying out. Prepare a rooting medium by mixing equal portions of sterile course sand, sterile peat moss and perlite. Moisten the medium with water to make it damp but not wet and put the mixture into a rooting tray. Remove all leaves from the bottom halves of the flowering cherry stems and dip the cut ends into powdered rooting hormone. Gently tap the stems to remove excess hormone. Stick the flowering cherry stems into the rooting tray at a depth of 2 to 3 inches. Gently firm the soil around the stems to hold them in place. Space the cuttings in the tray so the leaves of each stem are not touching. Mist the rooting medium and flowering cherry stems with water and place a plastic bag over the tray to hold humidity around the cuttings while they are producing roots. Open the cover several times a week to introduce fresh air into the rooting environment. Monitor the moisture level of the rooting medium to make sure the medium and flowering cherry stems do not dry out. Spray the medium with water as needed to keep the environment damp but not wet. Pull lightly on the flowering cherry stem cuttings after four weeks to see if there is resistance caused by root development. Transplant the cuttings to individual 4-inch growing containers once the roots reach a length greater than one inch. Grow the cuttings in a protected environment for a minimum of one year. Clean all cutting tools with a solution made from nine parts water and one part bleach prior to using.